Last weekend my wife and I went to visit the brewery of Summit Brewing Company in Saint Paul, MN. Summit is probably the best-known local beer, and they have their brewery very close to where I live. 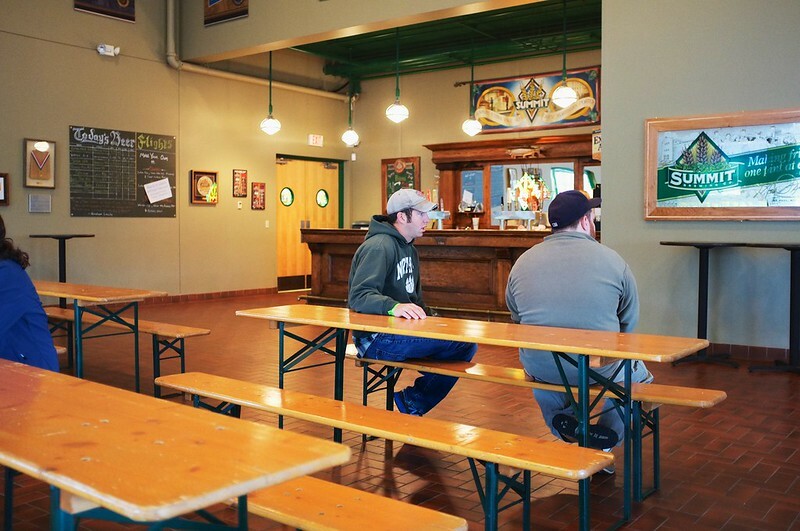 They offer free tours (you have to book ahead online to ensure yourself a spot) that last about 45 minutes, and at the end, you get to try three kinds of whatever beer they are presently brewing for free. And the samples are easily a full half pint, so they don’t skimp! I first went on the tour in January 2009, when my friend was visiting from San Antonio (if you’re reading this, we’ll go again when you come back up to visit again!) and we both enjoyed it. The fact that it is free definitely goes a long way to ensuring that their tours are pretty full; in fact, when I went to book my slot, I got the last one for the month of October–and the month just started! Tours are Tuesday/Thursday at 1300, and 1030/1300/1530 on Saturdays, in case you’re in the area. If you are, I highly recommend checking it out. We had the 1030 slot on Saturday, and so we arrived around 1015. Last time I did the tour, there were about 15-20 people in the group, and it was low-key. My, how times have changed. We were one of the first ones to arrive, but by 1030, the room in which we sat awaiting the tour (think about the size of a small school lunchroom, with picnic tables inside) was pretty full. There were probably 45-50 people on hand. I figured this early on a Saturday would be pretty dead. Boy, was I wrong. The group was made up of couples, families, friends, and even a bachelor party was there (getting an early start on the day’s events, no doubt). 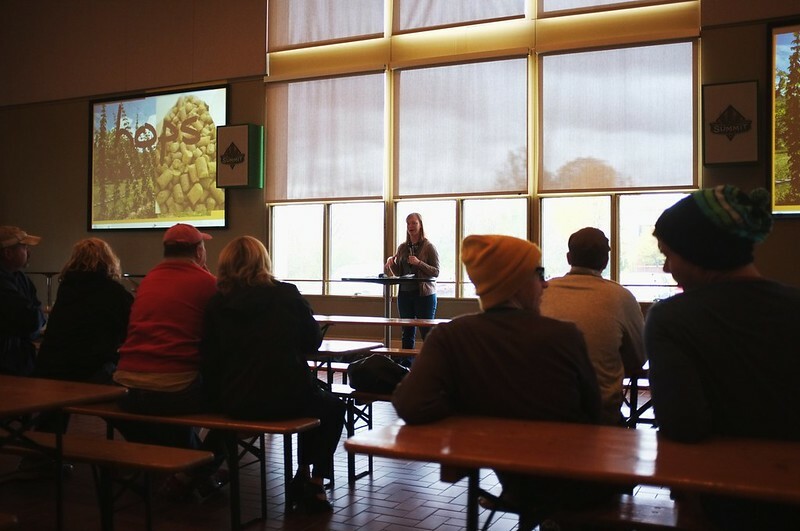 Before the actual tour starts, the woman leading the tour gave us a Powerpoint presentation on the history of the company, the owners, the current site of the brewery, etc; she also went into a brief story of how beer is made, what ingredients are needed, what varieties Summit brews, etc. Finally, she gave us an idea of how the company has grown, how much they brew each year, and where they do most of their business (90% of their sales are in Minnesota, and over 60% are in the Twin Cities area alone, in case you’re wondering at home). After a quick explanation of the rules for us tourists, we were split into two groups, and each group headed off on the tour, starting a different ends to avoid bottlenecking (no pun intended). Last time I did the tour, there was only one group. I’m glad there were two, as the people I were with were already a pretty large group. Seriously though, it was very interesting and informative. It was long enough to learn something, and not long enough for me to become disinterested or bored. The tour guide took questions along the way and seemed moderately knowledgable, even when straying off of her talking points. I don’t like all of Summit’s varieties, but I do like most. I will get to the three that I tried in a moment, but I got some bad news on the beer front. Summit has discontinued their Hefeweizen (which I quite liked) and has stopped bottling their Oatmeal Stout (which I also quite liked, though Samuel Smith’s Oatmeal Stout is by far a better oatmeal stout if you ask me), which you can now only get on tap. One of the coolest things about the tour is the fact that at the end, you wind up back at the start. Well, that in and of itself isn’t that great, but there are picnic tables galore, and there are games to play too; they had a giant Jenga set which was pretty neat. People sat around playing games, talking, and drinking beer. There is no rush and the proprietors don’t make you get out at any point. You can basically take as long as you like to enjoy your free samples. After we had our samples, we headed to the gift shop near the exit. I got a new T-shirt (the one I got a few years ago at the tour got shrunk in the wash) and a sticker for the window of my car (gotta rep’ the ‘Sota, as my friend says!) before we headed back home in what was a blustery, cold, fall day in Saint Paul. Later that night we had plans to go to a soccer game in Blaine, which I blogged about the other day–check it out if you want to see how that turned out! Awesome post. Doesn’t look like much has changed with the brewery and the tour, was it -13 outside this time too? As far as your reviews of the beer itself goes, you left off a very vital aspect, which provided the best buzz. There was more to the post than Bathroom Trevor!